On Friday I had a lovely relaxed analogue #jeecamp where I spent the majority of the day making notes on paper and talking to people, instead of having my nose in my laptop. As I mentioned yesterday, I still managed to send a 90 second video back down to London on the Guardian's intranet so that it was available to play during the commercial Open Platform launch developer challenge demos, and I also published a currybetdotnet post about HTML5 and IA. But, considering I was at an (un)conference on a subject I'm passionate about, that was a pretty light day for me. When I got on the train back to London, I tweeted a crowdsourcing question: Should I write a blogpost about #jeecamp, or simply put my iPod on and doodle. Twitter was unanimous - doodle. However, @helenduffet said, "In keeping with the chilled out analogue-ness, doodle a nice infographic. Then scan it in and hey presto - that's your blog post!" After the day's discussions, I basically identified 5 groups of people that I thought were important: The people who make, regulate, pay for, consume and disrupt journalism. And made the centre something I think we overlook, especially when we start obsessing about technology or using phrases like 'data journalism': "journalism is people's stories"
I took part in a discussion about law and regulation. Is the PCC the right interface between the people making journalism and the people legislating for it? Are ad hoc case law judgements the right place to decide the legalities of how web publishing relates to our existing slander, contempt of court and libel legal frameworks? The Caledonian Mercury experiment suggests that being a digital newspaper might be a 'mindset', rather than a case of also having a printed product. @stellacreasy was praised for using her new media presence during the election campaign to connect with her potential constituents, instead of simply using it to political point-score and grand-stand at a national level. Colleagues like @swillison @matwall @revdancatt and launches like the Open Platform are disrupting a media organisation from the inside. 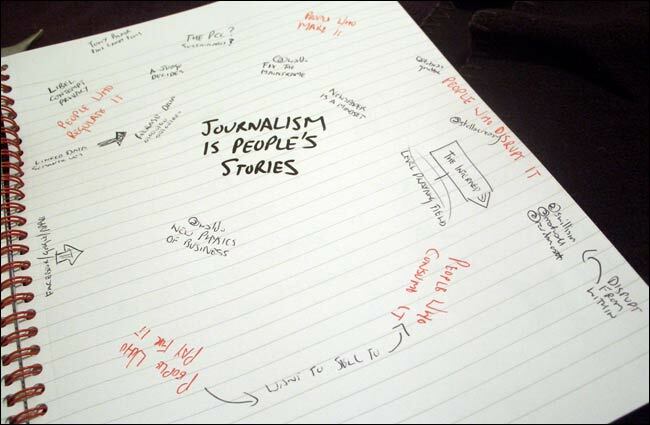 The Internet has levelled the playing field between those who make journalism and those who consume it. The people who buy the advertising, that pays for journalism to be made, want to sell stuff to the people who consume journalism. That hasn't changed, whether the product is in print or digital. I didn't know how Google / Facebook / Apple fitted into the diagram, but not to put them into it somewhere seemed like an act of old media denial. By Martin Belam on 25 May 2010.